Travel theme: Silhouette | Where's my backpack? 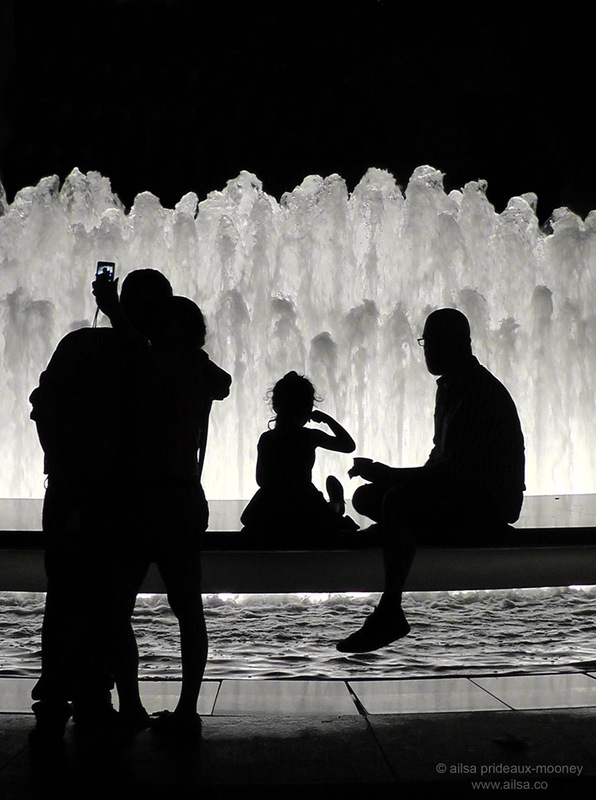 My favourite fountain in New York is the one at Lincoln Centre. Surrounded by the opulent architecture that houses the opera, ballet and orchestra; it never fails to delight the eye. The dancing waters rise and fall, at times resembling a ballerina’s delicate pirouette; at other times giving a tumultuous chorus line finale complete with jazz hands. It is dazzling at all times of day, but never more lovely than during New York’s long, hot summer evenings. 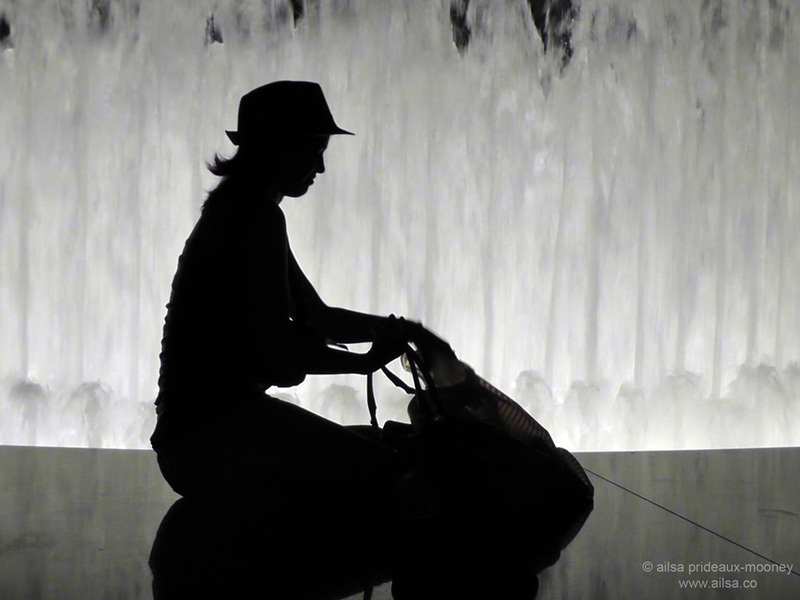 It was on just such an evening, after a disappointing Manhattanhenge, that I found myself wandering past the fountain, which was surrounded by New Yorkers hoping to escape the heat. The illuminated waters cascaded like luminous silk, and the silhouettes of the onlookers around its perimeter created such an enticing scene, I couldn’t resist reaching for my camera. It fascinates me how a silhouette; a two-dimensional outline of a person or object, can suggest a story just as clearly as if you could see the scene in its entirety. Perhaps it makes our imagination work overtime, trying to fill in the details we cannot see. 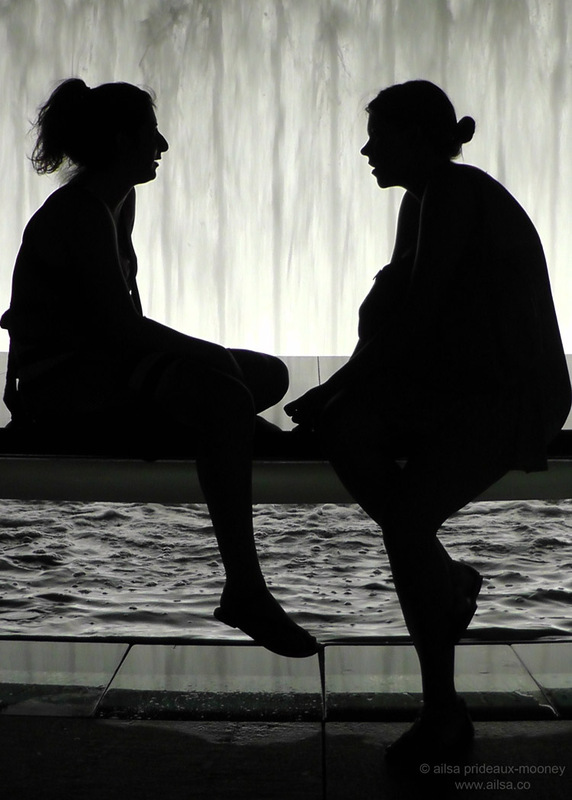 I would love to see your interpretation of this theme, so if you would like to join in, create your own post, title it Travel Theme: Silhouette and put a link to this page in your post so others can find it easily. Don’t forget to check back in next Friday for the next travel theme. I can’t wait to see what you come up with. This entry was posted in New York, Photography, Travel, Weekly Travel Themes and tagged photography, photos, pictures, postaday, travel. Bookmark the permalink. Shucks, thanks for the kind words, Cathy. I love your silhouettes, the Kyoto temple is my absolute favourite – the quiet containment of the temple structures set against the seeming wildness of the branches is just wonderful to look at. Oooh cool, Allan, an excellent backdrop for a silhouette photo shoot. I love how the blue almost seems to glow. Wonderful. That particular exhibit has to be seen to be believed, it is enormous. Imagine a high school auditorium full of water with a large picture window in the side near the bottom. I also love the blue color. These shots are just beautiful, Ailsa! 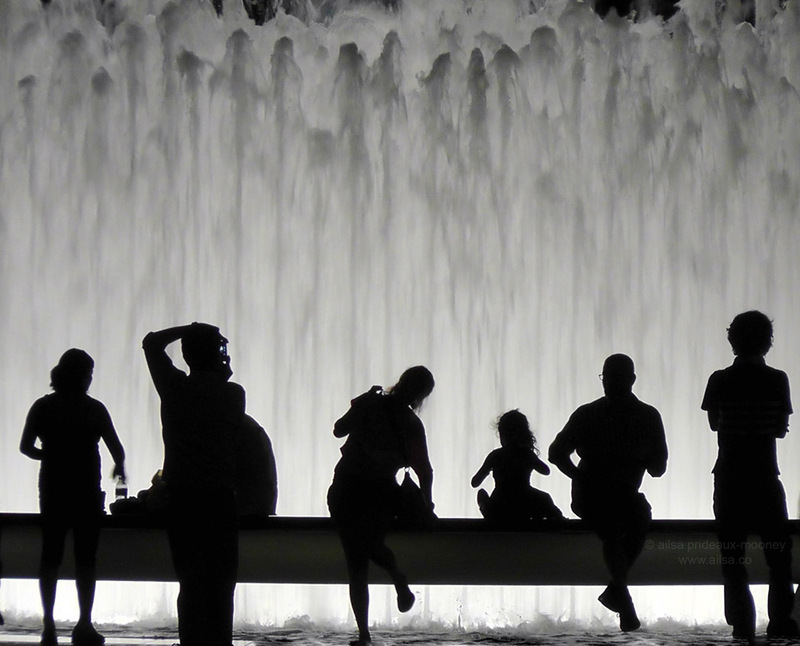 I’ve always loved the Lincoln Center Fountain, but I’ve never seen it like this – Every one is perfect! 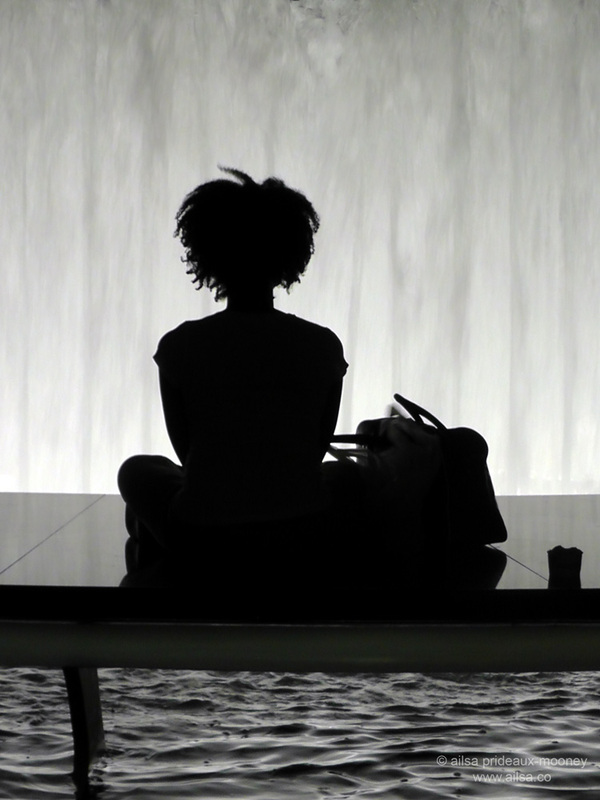 It’s funny, TRS, I’ve been to Lincoln Center countless times and have always been enchanted by the dancing waters, but this was the first time the silhouettes jumped out at me. I love your Koa tree photo, TRS, it really is quite lovely. For some reason, I am reminded of an early Willow pattern. You’ve out done yourself with these photos, Ailsa! Beautiful, interesting, intriguing compostions. Good one. I’ll be back in a few days with some shots! The last one; the first one; the second and third. What the heck…all of them! Pingback: Urban Silhouettes « Ink. Beautiful images Ailsa. The texture of the water is almost hypnotizing. Fantastic! I dug deep into the archives for these photos. I hope you like them as much as I enjoyed posting them. Can you guess where I am in the first two photos. Thanks Ailsa for another fun challenge this week! Thank you! And you are correct about the Pantheon! Ailsa, stunning photos – the water and enjoyers … my favorite pick .. is the lonely girl with her bag. Sceond for from the top. Ailsa, the water and lights makes a magical backdrop for your silhouettes. I’m off to see if I can find some silhouette shots. Beautiful and inspiring series of silhouettes. Thanks. What a tremendous idea Ailsa to pop up with! I think you’re put it right in your blog, in many cases less is really more. Your pictures tell so much in their sobriety, a thousand words could never do. My favorite is the last one, because of the intimity of the scene and the little detail that it gets repeated on the camerascreen so we all become a part of it too. Have a nice weekend y’ all! Thank you for the great theme! Happy travel, Ailsa! Did you arrange the photos/models or was it random people? Never thought of something like this. Inspiringly beautiful!